Sundays run will meet at the West Shore Paddling Pool, Llandudno, LL30 2BD. GR771821. Meet 10.30am. This week’s route will take in the quieter, more interesting and sometimes less trod paths, cliffs and nooks of the Great Orme. Refreshments afterwards if you’re good children. Ras Nadolig Eryri! Diwrnod gwych gyda thywydd braf iawn. Nifer fawr o redwyr mewn gwisg ffansi trawiadol iawn! Ras yn cychwyn o Westy’r Fic ac yna ymlaen am Amgueddfa Lechi ac wedyn o gwmpas y llyn ac yn ôl i orffen yn y Fic. Cyfanswm o bump deg pedwar o redwyr. Diolch yn fawr unwaith eto i staff y Fic am adael i’r clwb gael cynnal y ras yno ac am baratoi’r lluniaeth ar ddiwedd y ras. 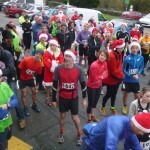 Eryri Xmas Race Results! Great day, with excellent weather conditions. High number of fancy dress runners in striking costumes! Race commenced from the Victoria Hotel, then onwards past the Slate Museum & around the lake then back to the Vic. Total of fifty four runners. Thanks again to the staff of the Victoria Hotel for letting the club use their facilities and for providing the refreshments at the end of the race. Photos and race results below. New Eryri vest design – vote YES or NO! If you were at the recent club AGM you’ll know that there are plans for a new design for the Eryri Harriers running vest. The decision is down to all club members, all members will have received an email with a link which will allow you to either vote for the new vest design or to stick with the present design. The questionnaire closes on December 19th, with the results announced at the Christmas Fun Run on the 21st December. V40 urgently needed for this Sunday!!! 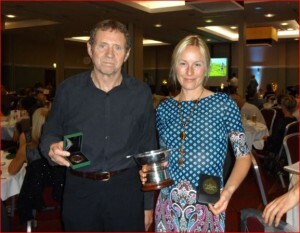 Due to injury and man flu, two position in this weekend’s v40 team for the British Fell Relay became vacant this week. One has been filled but the other remains available to any eligible v40 from Eryri. Phone Dylan Wynn Jones on 07917 173815 if you can compete.